There is a lot of fear in the markets and several stocks in the mid and small cap space are having a free fall. These are the great times to focus and research more on the companies to find undervalued gems. Last month, we toured South India to attend a few AGMs. We visited Avanti Feeds, Shilpa Medicare and Swelect Energy. The meetings were good and the companies seem well placed. It is often concerning to watch a few shareholders holding nominal quantities and coming over for free gifts and snacks. Despite good arrangements and the good work by the management, these shareholders often sabotage the proceedings. We need to fix this, otherwise the promoters will never treat the minorities properly. Probably having a video conferencing of AGMs may help. Avanti Feeds: We have discussed the company many times in past and the stock has performed well too. The industry continues to see high growth rates of 30%+ since the adoption of the new shrimp specie – Vannamei. The company is superbly placed in its sector (due to the support of TUF) and ranks among the top. The management seemed quite honest, hard working and conservative. They were one of the first to understand the potential of the Vannamei specie in India and took various steps to get it introduced. The company has grown from a turnover of just 100 Cr in 2009 to 650 Cr in 2013. Avanti seems well placed as the industry is expected to remain on a good growth path for the next few years. The company has come out with a fantastic Q1 result. Going by the current prospects, the company may do about 950-1000 Cr turnover in 2014 and deliver an EPS of 50+. At current price of 180, the stock continues to look attractive at 5 times earnings. Here is a good article which highlights the ongoing positives for this sector. Shilpa Medicare: The company is based out of a small town – Raichur. It was quite amazing to learn about the company’s endeavors in setting up a high quality R&D and getting the right talent at such locations. The company seems to have the right set of values of working hard, doing something different and being risk averse. The company is moving up the value chain and has also entered the formulations space targeted towards oncology segment recently. However, the regulated market approvals such as USFDA and EUGMP may take some time to commence, and thus the few upcoming quarters can be dull. 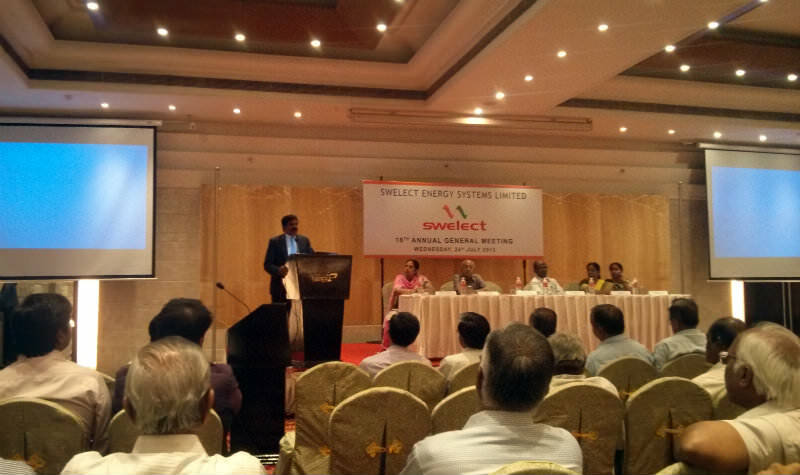 Swelect Energy: The company earlier known as Numeric Power had done very well in the UPS business and after scaling it up in a span of just 15-20 years, they sold the same for 840 Crores last year. The company is now sitting on 500 Crore of cash on the balance sheet and has entered the solar energy sector. The company sees a big potential for this sector and believes it to be at an inflection point in 2-3 years. As of now to start with, they have focused on rooftop solar installations and have become a big player in the same. Going forward they intend to develop big solar farms of capacity of about 25-30 MW and allot/sell capacity of 3-5 MW to different corporates. They have also invested in solar module manufacturing company, HHV Solar, and believed to be making one of the best quality modules in India. Thus the company targets to be present across the whole value chain of solar energy and get better margins than others. As the business is in initial stage, it may take at least 1-2 years for true picture to emerge. In the previous post, we had discussed some PSU companies like NMDC. After the post, we got some valuable feedback about these companies’ real problems and we felt that the problems are bigger than we expected. Most of these PSUs are highly inefficient companies (like in NMDC, the actual volume growth has been nominal over the years) and being an election year, they are in a very risky zone. Some unnecessary merger/acquisition/dilution/expansion or deal can take place and the cash surplus in the balance sheets can suddenly disappear. It is better to concentrate on the companies where the owner’s interest and the shareholder’s interest is aligned. We have exited most of the small position we had in these PSU companies. Ajanta Pharma: The company seems to be consolidating its position and has posted a decent set of numbers once again. Given, its leadership position and rankings in several sub segments, it might be a good buy on sharp declines, if any. Can Fin Homes: The company has posted an excellent result once again. There is a 50% growth with good management of loan book and low GNPA at just 0.40%. Yet, the stock is trading at attractive valuations of just 0.70 times BV and PE ratio of 4.5. Here is their presentation, which gives good insights about the business. Poly Medicure: One of our long term favorite, it continues to perform exceedingly well. The wonderful performance has started to show up as the forex losses have ended. The noticeable thing is the consistency and the high margins the company has. Atul Auto: Though the company has not come out with its Q1 results, they have declared their sales numbers for the month of July, 13. They have done well by delivering a growth of 20% even in this tough environment. GRP: The company’s Q1 results are much better than Q4, FY13 results wherein the company posted a small loss. Still the Q1 numbers are weak as the company continues to be affected by the pressures of weak demand and surging costs. If one reads the company’s FY13 annual report carefully, one can get a good insight on the quality of the their business and their long term prospects. Oriental Carbon: On the face, the Q1FY14 result may not look good but in our view, the company has done very well as the profits are down due to the provision for forex loss of about 5 Crores. Being a net export company, this forex provision seems to be on account for the borrowings done in foreign currency. If one removes this provision, the company’s margins have expanded and are at about 30%+. Going forward, once the rubber industry improves, the company should do well. Also this company is a major beneficiary of falling rupee. MPS: The Q1 numbers look decent. We have received a positive feedback from the friends who visited the AGM. The company continues to provide a very good dividend yield of 9%+. We continue to look forward to the wonderful discussions and feedback from our readers through comments. Hi Ayush, a small doubt. Do we have to take Forex loss into consideration or ignore thinking those are short term. Because even for Astral If we take forex loss into consideration actually the company had to post loss, but still the stock is holding up in weak market. In the case of Astral, the forex loss should be seen at yearly levels. As majority of the profits come in second half, the impact is not very high. Also, the co has been consistently following this policy of providing the forex loss at year end only. B Braun has won preliminary injunction against Poly medicure safety IV catheters in spain..
Will the adverse order impact sales heavily ? Do you track Arcotech? The company seems pretty good and a buy on declines. Any suggestion?? ayush can u please provide link to RSS feeds to your posts on myyahoo? From what I understand, as of now Polymed gets little revenues from this product and the sales from Spain are expected to be very small. This is a good product which was patented by global major – B Braun and hence they have been fighting the case aggressively. Till now, PolyMed has also won the case at several places but the litigation continues. As of now, it may not impact current sales but we should get clarity as this may limit their growth potential. With respect to Swelect, what is your opinion about the management’s seriousness to deploy the cash? Also, do you prefer to invest before it has proven its earning potential in a new industry? The management seemed very serious on the solar sector and I feel that they will be able to make significant inroads in 2-3 years. Timing is a tough thing here…it should be individual call. Yes, if the subsidies/incentives announced by the Govt are actually honoured then cos are getting very good IRRs. I would like to know whether for Banking stocks does it really matter to see Cash Flow from Operations….? Because most of the NBFC and Banking stocks were having negative cash flows from operations. I know we should have a look at its asset quality, NPAs, CASA Ratio, CAR etc…. But still some banks like CorpBank shows +ve cash flows for last 5 years where as consistent performer like HDFC bank shows negative cash flows. So in banking and NBFC -ve cash flow is good sign or bad sign or whether to ignore this completely for banks and NBFCs? For banking companies we personally focus more on the quality of assets and the sources of funding them. The cash flow statement is much different for banking companies than for manufacturing companies. The borrowings and their repayment form part of operating activities instead of financing activities. For this reason the cash flow statements of banks might be harder to interpret than comparing the balance sheets on two year ending dates. But don’t you think this is the best time to buy Banking stocks as they have been beaten down very badly in the recent times. And you can see the dividend yields of most banking stocks are now 9% or more which will be tax free in hands. It may be a contra bet too in this space… You opinion please. The asset quality is very important…as the banks are highly leveraged, a small mistake can blow out the balance sheet hence one needs to do homework. Well, since NBFCs and Banks leverage 7 – 10 times, their debt equity ratio is normally very high. Now using the funds that they have borrowed, then then proceed to lend the total capital, which also might include cashflow generated during the year from operations. Hence, it finally results in Negative Cashflow from Operations. Also, their RoCEs are very low, and these parameters are not strictly comparable with the non-financial sector companies. Best way to analyse banking stocks is (if we first ascertain the environment is right and potential in this space is large) is to have a peer comparison of the banks – RoE, Net Interest Margins, CASA Ration, Non Performing Loan Ratios, Restructured assets to total assets, growth in deposits and lending book/AUM, Fee Income generated, branch net work, management team, and finally the dividend pay outs. On this basis, some of the best plays in the industry are Axis Bank, HDFC Bank, J&K Bank, Yes Bank, Bajaj Finance, ICICI Bank (under the new leadership of Chanda Kochar has transformed into a less risky more profitable bank), ING Vysya and Indus Ind Bank. All of these will provide attractive long term returns, but perhaps, Yes Bank, Indus Ind, ING & J&K because of smaller market caps might outperform the larger ones over a 5 to 10 year time frame. Hope this is useful. 1. The salary to the management is very high. Why don’t they balance it by way of higher dividend? 2. Lots of related party transactions. Shareholders also fear conflict of interest due to the MD wanting to enter politics. 3. The auditors are said to be ex-employees and doing work only for Amaraja. Dear Ayush, Agree with you on these concerns. But on the positive side, they have very little of debt, increasing cash flow from operations and dividend payouts have also been higher year on year, with capex being done out of internal accruals. Also Johnson Controls, USA, the foreign technical partner has a 30% stake, if I am right. That gives reasonable comfort…have been an investor in this since 2005-06, with an average cost post splits, etc of Rs. 4.78 per share. Any view about rohit ferro tech?? This is one of the best blogs and I never found a simple screener with so many parameters to customize on. YOU GUYS SIMPLY ROCK! Thanks. any view on hitachi home & life solutions? june quarter results have been excellent along with promoters hiking their stake. We are not tracking it closely. Its a good co.
GRP : Could you please explain why demand is weak for recycled rubber. If recycled rubber is cheaper than rubber, it should always have demand as long as rubber is in demand. Except for food and medical usages where virgin rubber may be required. The reclaimed rubber is used in production of new tyres and rubber products. As there is a slowdown in manufacturing activities worldwide (like decline in auto sales etc) hence the demand has decreased. The financials have been impacted adversely as the co had done a major expansion while the demand didn’t increase accordingly. Hi Ayush.. Long time.. would love to see more in frequency of your articles. If one has to invest in oil and gas space purely on risk free cash and dividend play keeping in mind future growth perspective.. which one would you recommend? Between OIL India and Cairn which would be a better div yield play and also have better earning potential? Yeah, we would like to post more but we also feel quite time constrained with the indepth work etc, we have been doing on several stocks. We don’t track both the cos closely but given the uncertain government policies, Cairn looks better. Some of the recent Annual Reports that I found very interesting – Alembic Pharma – RoCE has reached a high of 34%, debt is continuously been reducing, higher dividend payouts, free operating cash flows have surged to around Rs. 250 crores with a market cap of Rs. 2700 crores currently. It might not be a small cap exactly, but given the pharma sector market caps of Rs. 10,000 to 135,000 crores, this company can be a multi bagger. They also have become very aggressive on R&D spends and new drug filings/approvals. At a inflection point. What’s your take on Shilpa Medicare? Is its business model comparable to that of Divis Lab which is also into CRAMS n API manufacturing? What are the similarities n differentials ? Are there some triggers in Shilpa which may lead to some rerating? Yes, Alembic has been doing some very good work over last 2-3 years and has build up a good pipeline of products for the US generics markets and co is very likely to do well over next 2-3 years. However, on the concerns, the management quality is something where comfort is not very high + the domestic business which forms more than 50% of current turnover is expected to remain under lot of pressure. Another interesting Annual Report was Somany Ceramics. Increasing RoCEs, higher dividend payments, and more important management seems to be hungry to prove itself and be on par with Kajaria Ceramics. Low PE and could be re rated over next 3 year. AT CMP of Rs. 75 – 80, could be a multi bagger. Good brand, with increasing spend on brand building. Please read the Annual Report – very insightful. Yes, Somany has been doing very well. I tried doing some ground work and the feedback was very positive. What is view on Balaji Telefilms and Pratibha industries? Hi…Any idea about Atul Ltd?